Roy Moore is a fruit loop and he's hopelessly unqualified, but at least he stands for something -- even if it's wrong. Jones is a political street walker, taking cash from the first John who comes along. Memo to Doug Jones: Jeff Sessions has lied to Congress umpteen times, and he's at the heart of the worst political scandal in American history. Might not be a great time to seek support from Sessions' supporters. The thought of Roy Moore in the Senate is so sickening that even Richard Shelby is nauseated. Never thought I would see the day. Imagine how one-sided this thing would be if Moore weren't a child molester. For the first time in 35-plus years in Congress, Richard Shelby finally sounds like a statesman -- like he has a few principles, other than sticking up for big banks. I guess Roy Moore helped him reach his puke point. 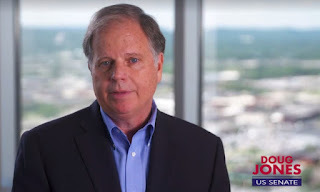 Doug Jones must be the worst criminal defense lawyer on the planet. Our nation's federal prisons are filled with his former clients. I can't think of anybody he's ever gotten off. Never thought I would see the day when Richard Shelby actually sounded like something other than a whore for big banks and financial institutions.